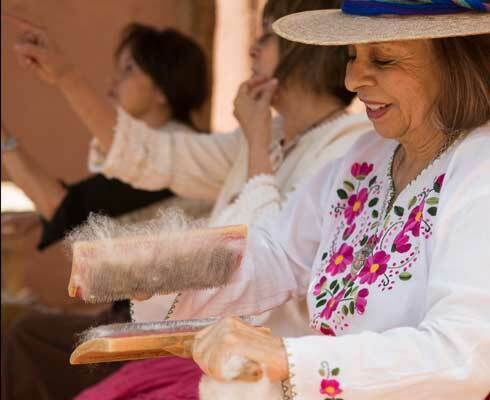 AT EL RANCHO de las Golondrinas, a sprawling “living history” museum south of Santa Fe, colcha embroiderers demonstrate their craft on a dusty plaza enlivened by the aroma of fresh-baked bread. Julia Gomez, dressed in a long red skirt and a peasant blouse, invites eager children to clean wool sheared from the museum’s Churro sheep. They rub the rough wool between two wide brushes until it turns soft and thin, ready to be made into an embroidery yarn, just as Spanish colonists did 400 years ago. It is here at the museum that Gomez first learned the history of colcha embroidery. Spanish women introduced the craft to New Mexico as a way to mend holes in their bedspreads (called colchas) and to spruce up a utilitarian wool textile called sabanilla, injecting beauty into lives ruled by arduous labor. Gomez came to understand colcha’s legacy as a part of New Mexican culture that has escaped extinction more than once, and which she is determined to see thrive again. At her home, Gomez shows me the colcha stitch, which was a practical way of preserving yarn at a time when the only textiles available came from sheep. She draws a rectangle on the material and threads the yarn through the top of the shape, anchoring it with two small stiches. She pulls the thread loosely down to the bottom of the rectangle so I can sew small stitches back up, tacking down the long stitch and making neat rows across the rectangle. When my thread is almost gone, Gomez carefully weaves the last of the thread through the stitched lines. The fibers in the yarn stick together, eliminating the need for knots and creating a smooth finish on the back of the material. Embroiderers like to say there are no rules for colcha beyond this basic technique. The size, angle, and spacing of the stitches are left to personal preference, which can feel liberating compared to other embroidery techniques that demand specific regimens. Though traditionalists still use hand-spun, hand-dyed wool on sabanilla, a second style of colcha made from commercial yarn on cotton or linen emerged after the Santa Fe Trail opened in 1821, says Josie Caruso, a retired textile restorer who served as historical consultant for the book New Mexico Colcha Club. In addition to bedspreads, colonial women embroidered curtains, tablecloths, and altar cloths. As these items became commercially available, colcha went into decline and might have disappeared entirely had concerned Santa Feans not founded Spanish Market in 1926 to promote traditional colonial crafts. The deaths of both founders in the 1930s and the Depression took a toll on Spanish Market, which fell silent for a few decades. Colcha once again began to fade from memory. Gomez’s generation had few teachers to pass down the tradition. She did learn to sew her own wardrobe, though mostly out of necessity—no clothes ever fit her 4-foot-6 frame. The homemade tailoring satisfied her. “We were poor, and I could make anything.” Gomez took a colcha class in the seventies, but she was too focused on work and raising her daughter by herself to delve into a craft that, by then, only a few women maintained. Most colcha artists get their start because of persistent, supportive mentors. Late in life, Gomez found hers in Monica Sosaya Halford and Beatrice Maestas Sandoval. Sosaya Halford, who has shown pieces at Spanish Market since 1979, helped to familiarize Gomez with the art form. Maestas Sandoval, whose 2001 Spanish Market grand prize helped renew interest in colcha, led Gomez to Las Golondrinas. Gomez was hooked. Her work quickly began to earn top awards at Spanish Market and the State Fair, and even in China. The Albuquerque Museum of Art and History bought a prize-winning bedspread for its permanent collection. This year, a wall hanging of hers, featuring a large tree bursting with colorful birds and flowers, won the centerpiece spot on Spanish Market’s promotional poster. Gomez is one of a few local artists who prefers the traditional style of colcha. She creates her pieces with brightly colored natural dyes—marigold for yellow, indigo for blue, and the dried female cochineal insect for a brilliant, pure red. Her motifs are equally vibrant and personal, each piece reflecting one of her loves: animals, flowers, and her devotion to family and to the Catholic Church. The connection with her creations is clear, as is the work involved. Though most colcha artists make only pennies per hour from their labors of love, Gomez says she only regrets that each sale deprives her of a memento. Julia Gomez cards wool to be turned into yarn. The time involved to make colcha embroidery, especially the old-fashioned way, keeps it a niche pursuit, but a close-knit community of colcha artists is working to ensure the craft’s future. The “Golden Girls,” as Gomez calls her fellow colcha embroiderers, have the leisure time to devote to the craft and the maturity to appreciate its history. 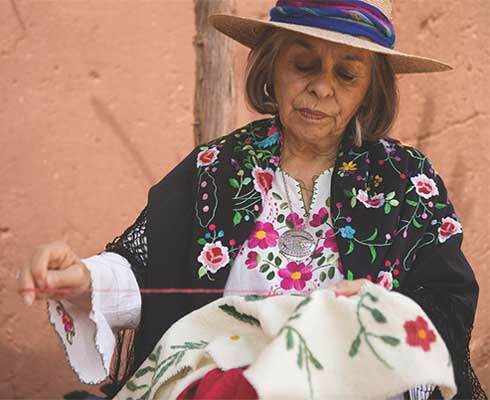 They teach classes, advise colcha clubs, and personally mentor newcomers with the hope that New Mexico’s first style of embroidery will never be lost. A few years ago at Spanish Market, Gutierrez Turk was introduced to a nine-year-old named Liberty May Gonzales who became fascinated with Gutierrez Turk’s embroidery. As the girl grew old enough to do her own colcha work, Gutierrez Turk offered to mentor her. But when Gonzales, by then an outgoing 12-year-old cheerleader, revealed her plans for a colcha pattern involving archangels and flowers, Gutierrez Turk says her heart almost broke; she was worried her student couldn’t finish such a large, ambitious piece. Not only did Gonzales pull it off, she won Spanish Market’s 2014 youth colcha award. This year she’ll be there again, with the Golden Girls nearby, carrying on the tradition. —Deborah Busemeyer wrote about the Mesa Prieta Petroglyph Project in the May issue. El Rancho de las Golondrinas, a living history museum on 200 acres 20 minutes south of Santa Fe, depicts the culture, food, and music of northern New Mexico during the Spanish Colonial period. Volunteers demonstrate wool carding, weaving, dyeing, and colcha embroidery from 9:30 a.m. to 4 p.m. every Friday, except before festivals. Kids age 12 and younger are free for all events. Wednesdays are free for New Mexico residents June through September. Bring a picnic lunch or buy food at the historical ranch. (505) 471-2261; golondrinas.org. 2016 season: Self-guided tours 10 a.m.–4 p.m., Wed. through Sun., June 1–Oct. 2; $6 adults, $4 age 62 and older, teens 13 to 18. Santa Fe Wine Festival 12–6 p.m., July 2–3, $13 adults 21+ (includes wineglass), $5 teens. Santa Fe Renaissance Fair 10 a.m.–6 p.m., Sept. 17–18, $10 adults, $8 seniors/teens. Other festivals cost $8 adults, $6 seniors/teens and include “¡Viva México!” Celebration 10 a.m.–5 p.m., July 16–17; Summer Festival & Wild West Adventures 10 a.m.–4 p.m., Aug. 6–7; and Harvest Fair 10 a.m.–4 p.m., Oct. 1–2.